This is the post I’ve been looking forward to — or dreading. I can’t decide which. My thoughts on Francisco Cordero are decidedly mixed, and they really have been since the day CoCo signed the big free agent deal to join Cincinnati. Until last season, I’ve been a fan of Cordero, but I always thought his salary was too large to be justified (within the context of a mid-range budget, it’s difficult to spend that much money on someone who only throws 60 innings, no matter how good the pitcher is). I tried to ignore the budget issue, though, mainly because CoCo was really a pretty darn good reliever (and his paycheck wasn’t coming out of my own pocket). Last year, things changed somewhat. Cordero’s effectiveness took a drop, and he became enemy #1 for some Reds fans after one too many blown saves. Just as I was reaching my personal limit on Coco, he did something that — surprisingly — actually made me like the guy more than I had before. He stood in front of the microphone and accepted all the blame and said that Reds fans were right to boo him because he wasn’t getting the job done. That didn’t make the blown saves any more palatable, but my respect for Cordero the person increased immeasurably. Maybe that’s because I still remember Danny Graves blaming everyone else for his failures, but whatever the reason, Cordero stood out as a stand-up guy. I’m rooting for him to return to his prior form. That said, Cordero didn’t have a great year in 2010, yet he’s still going to be paid a lot to perform at the back of the bullpen in 2011. So, letÃ¢â‚¬â„¢s hear the NationÃ¢â‚¬â„¢s collective wisdom about Francisco Cordero. Is he overrated, underrated, or properly-rated? What is his future with the Mighty Redlegs, and what should his future be? This should be an interesting one…. Does it seem strangely quiet to anyone else? 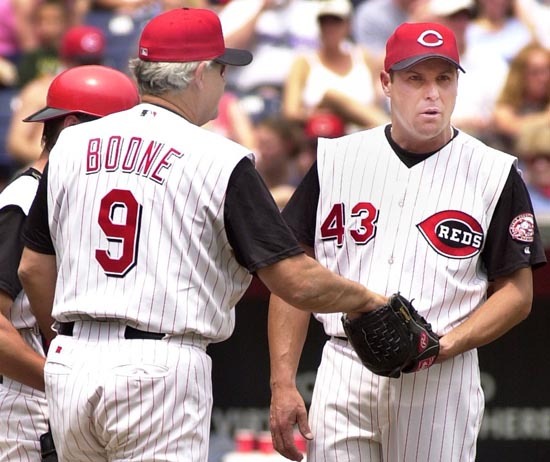 Weekly Reds Obsession: What is your favorite Opening Day memory? I remember being shocked and overjoyed when the signing was announced. To me it spoke volumes that the franchise was getting serious about competing….and that we took a good player away from one of our rivals in the process. In hindsight, my response should have been more measured. We were in no position at that time to fight for a playoff spot, and for the majority of his tenure he’s been a shiny hood ornament on a clunker. Now that we’re competitive, it makes a bit more sense, but clearly not at that salary level. The bottom line is that there’s a million power arms out there. A shrewd GM can find those guys and build a good bullpen for less money. If you overpay, it can only be for an elite player. CoCo has been very good at times, but not exactly elite. I think CoCo’s success is going to depend on his ability to adjust. As his age has and wear and tear on his arm increases his effectiveness has decreased. The great closers have done it. Look at Trevor Hoffman (from flame thrower to puss thrower). Eckersly, Franco, etc. have all done it. If he is convinced to change he will be back on top. If he does change it obviously will be a huge addition to the staff. Agree with what Chad says. He is a league-average closer, nothing more, but probably nothing less. If we were signing a one-year deal with Cordero just for this year, I wouldn’t pay him more than $5 million. Nick Masset on the roster makes me reluctant to even go that high. I’d much rather spend the money on a good left fielder. There is absolutely no data to indicate that closers in general are anything other than massively overrated. I’d like to see the Reds shop Cordero, even if they have to eat a significant portion of his salary. His K/9 has gone down 3 consecutive years now (12.2, 10.0, 7.8, 7.3) and considering he’s turning 36, I just don’t see that coming back up. When his strikeout rate is close to double digits he can afford the >4 walk rate he’s had most of his career, but clearly that isn’t happening anymore. 4 other Reds relievers had 40+ IP with a K/BB better than Cordero’s (and that’s not including guys with fewer innings like Bray, Herrera, Maloney, and Chapman), so I think we can afford not getting much in return and simply making a little more money avaiable. Half of Cordero’s salary should be enough to sign someone like Rauch. The big thing about Coco is, you have to remember when he was signed. After 2007, when the bullpen was a royal mess. Closer by committee, Mike Stanton, ugh. When Coco came in, he set defined roles for everyone in the bullpen. You knew who was getting the ball in the 7th and the 8th. He made the 9th inning a more sure thing. He got the bullpen back on track. He is one of the few veteran leaders out there. Even when he blows a game, he comes out with dignity and class, taking responsibility, not freaking out like a certain former closer we had. He shows the young guys how it’s done. Sure he’s paid a lot, but I believe it’s worth it for the piece of mind he gives the rest of the relievers. A strong bullpen is essential for a winning team. The guess here? Next year he comes out real strong from the bullpen and has a bounceback, 2008-like year. So, I say he’s underrated. That said, he’s set the bullpen on the right track, but this season should be his last. He’s due too much in 2012, we have other contracts to pay off, the bullpen should be fine now. He’s done his job in showing guys like Bray and Masset how it’s done up here. I agree that the bullpen situation was pretty terrible after 2007 and even though it was fairly evident that Cordero’s contract was too big, I wasn’t totally against it in the beginning because I agreed that it was worth it to shore up the back end of the bullpen and move on to other problems this team still had. All that isn’t very quantifiable, so for now it’s hard to say how “valuable” it was to get our bullpen roles in order and potentially provide some veteran leadership (I don’t really know if Cordero has provided it or not). I will agree that a guy who takes responsibility is admirable and certainly helps the ever mysterious “chemistry” factor. I also agree that Cordero was a pretty decent closer in 08 and 09. The fact is though, Cordero was barely better than replacement last year. Before that he registered a 1.7 and 1.8 WAR for 08 and 09 respectively (according to B-R), and using fangraphs 2008 calculation of cost per win ($4.5M) Cordero was only slightly overpaid in 2008. I don’t have updated cost per win numbers, but even assuming a slight increase (though you can argue that the 08-09 offseason saw some DEFLATION) he was overpaid by a bit more in 09 and GROSSLY overpaid in 2010. If he gets a little lucky he might be serviceable in 2011, but I’d rather have Masset back there, and ideally I’d take what I can get from him and let some other team juggle the perception that he’s still an above average closer. I think any discussion starts with his salary. Stand-up guy or not, that’s a lot of salad for a fading closer on a small market team. I don’t see the rebound happening in 2011. Luckily, the Reds have options and hopefully by February, they will have even more options for the pen. I’d love for the Reds to unload that salary, but I don’t see how they can do it. In the meantime, it isn’t like he’s the worst pitcher and can’t be used. But he best not have a bad spring or a bad April and ruin all of his value. He’ll be lights out this year. It’s the final year of his contract. To me, Coco isn’t any-rated. He just “is”. My reasoning for this is, inevitably, when discussing Coco, the conversation turns to his salary within like six seconds. Unlike Aaron, I don’t see a market for Coco, even if we covered half his salary. So, if we are stuck with the salary (understanding that is simply my opinion), we are better off with him in our bullpen than trading him for a four way with beans. My sincere wish for Coco this year is to continue learning how to truly pitch. Since his fastball has lost some of it’s luster – he’s got to do a better job of pitch selection vis-a-vis the situation. Most critically, he needs to get into a lot more 1-2 counts than 2-1 counts, even if it means he occasionally gets hit hard early in the count. He was much better at this down the stretch, but the first two thirds of the year was absolutely frustrating to watch (similarly, Cueto is starting to figure this out as well). Those were some of the same points I was going to mention—-signing Cordero was absolutely neccessary at the time and at the time, he was as close to an elite closer as could be had. But this aside, I see him as totally expendable now. The Reds have better pitchers coming up. Before I get into that, I want to reitterate how absolutely foolish it is that relief pitching has been made so specialized and micro-managed. To have a one-inning closer—-or any reliever who is just there to face one hitter each game—-means the entire team (and the fans) live or die with evry pitch. As we saw with Cordero last year, if he’s having an off day, if he gives up two hits as soon as he enters the game, it’s over, no more chances to win that game and there’s no one else who can close it out. It’s better to have a two-inning closer coming in in the 8th, giving him plenty of time to warm up. We have seen new obsessions with deciding the value of a reliever based on whether or not his first pitch is a strike! Seriously? Can anyone tell me what Walter Johnson’s first pitch/strike ratio was? Does it make a difference when you consider his entire career? Hell, Mike Stanton had a very good FP/S ratio for most of his career and what good did it do the Reds? My point is, for the limitations that are put on relievers (one inning or less) and the high risk of failure because of those limitations, any reliever making more than $5 million a year is over paid, wich makes Cordero a white elephant when he fails. He’s paid $12 million to get saves—-if he can’t do that, what are you going to do? Pay him $12 million to set-up? I will also mention again, he’s kind of a prick. I don’t know how he treats the fans in Cincinnati, but I know for a fact, from what I’ve seen with my own eyes, if you’re not Dominican, don’t even bother talking to him. I’ve seen him at Mets and Yankees games the last few years, he’ll sneer at some little white girl asking for an autograph but if it’s some middle-aged Dominican guy, he’ll go out of his way to say hello and sign evrything the guy puts in front of him. @JD:Those were some of the same points I was going to mentionÃ¢â‚¬â€-signing Cordero was absolutely neccessary at the time and at the time, he was as close to an elite closer as could be had. David Weathers was in a defined role as the closer that year (2007.) Cordero first year with the Reds in 2008 was with near-equal results to Weathers year as closer in 2007. The bullpen as a whole was better with 2 “David Weathers”. It would have been a more efficient use of funds to go after another 8th inning “Weathers” and leave Stormy as closer than go after an “elite closer” for the 9th inning, and then not have the length of contract risk the team is saddled with now. Don’t get me wrong, I was as frustrated as the next guy watching Coco close games last year. However, I would have to argue that he is a bit more than the average league closer – even last year. He was 3rd in the NL and 5th in all of MLB in saves. Yes, his 8 blown saves rank fairly high (or low, depending on how you want to look at it), and the fact that those 8 blown saves don’t include the numerous “close calls.” But, he still saved 40 games!! He may be overpaid, but I am still rooting for the guy this year. I hope he figures it out more so b/c I think he can be used the next couple of years as a valuable mentor to our young staff. His save “number” is a counting stat. Almost any pitcher on the Reds would have that same number of saves with the same opportunities. My opinion is that it was a mistake to sign him at the time and now our hands are tied (see “Rolen, Scott” at least by 2012 if not before). A closer would be more valuable now. The horse is now needed and we can’t get him because we placed the cart in front of the horse a few years ago. To be clear about Rolen (since I inserted him). I thought it was a mistake to trade for him, but I do think he was instrumental in our success this year. I do think it was a mistake to extend his contract. I also thought it was a mistake to extend Harang’s so long and I’m not real thrilled with extending Arroyo’s too far either. I’m not anti-veteran…I’m looking for the right veterans at the right time. The Yankees are at a cross roads with Jeter. The free agent contracts for Larkin and Griffey were too long. If “only” they could be in incentive laden at the end. It’s a gamble because teams need to keep some players for marketing and fan interest, but there is a reason I like “large market” teams. Let those teams pay for the veterans with diminishing returns. Stand-up guy, but sit-down closer? I donÃ¢â‚¬â„¢t think Cordero is overrated so much as CLOSERS are overrated. ItÃ¢â‚¬â„¢s an important position, sure, but there are very few that have the staying power of a Mariano Rivera. Generally, closers throw heat and have a limited shelf-life. A good closer is worth a little more than a middle reliever because most of the time he will have that fire for a few years and then go back to middle relief anyway. I donÃ¢â‚¬â„¢t think Ã¢â‚¬Å“closer by committeeÃ¢â‚¬Â for the DECADE is a bad thing. I just think itÃ¢â‚¬â„¢s a waste of money to contract a closer for a long-term deal. I was one of those fans that was definitely on the Ã¢â‚¬Å“kill CorderoÃ¢â‚¬â„¢s contractÃ¢â‚¬Â list last year and I do appreciate his taking responsibility for his performance. But I also hope that humility also means heÃ¢â‚¬â„¢d consider stepping aside for a new closer in the pen. Simply put: he’s not valuable. There are better options, even on the club itself, to replace him. Incredibly overpaid, incredibly under-performing. Closers are overrated. That is, unless you’re talking about one of the top 3 stud shut-down closers in the league and Coco isn’t even top 15. As is the case with Harangutang for me, you have to separate the baseball aspect from the personal. Coco’s not a bad guy and you have to admire any professional athlete for taking personal responsibility for poor performance, but the fact remains that he wasn’t good last year and the Reds won *despite* him and lost some games *because* of him. I’d love to see him go off into the sunset, arm-in-arm with Harangutang.